ROBERTO VAZQUEZ is a multi-talented Award Winning singer/songwriter that comes to us from the tropical island of Puerto Rico. 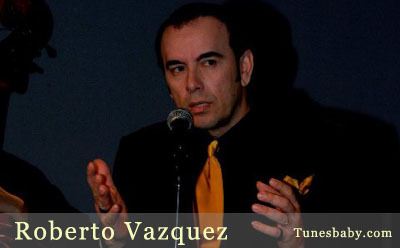 ROBERTO has established his talents and privileged voice before numerous audiences worldwide including the United States, Puerto Rico and Latin America. In his native island, he made television guest appearances on El Show De Las Doce, Palmas Del Mar and Despierta Puerto Rico, televised by the Telemundo Network. He has participated in prestigious Hispanic festivals such as: International Festival of Song, OTI Festival of Song and Voces De Latinoamerica as top finalists. He had guest appearances on Univision Network’s Good Morning America show “Despierta America” and their #1 variety show “Sabado Gigante International.” Manhattan Center of NY marked several performances for the Tele-marathon for the children of Puerto Rico. In addition, he has also had the honor of performing next to Legendary Latin Idols such as José José, Tito Puente, Tito Nieves and Sandro de America among many others. He is also a gifted musician. Roberto plays the guitar, keyboard and percussion. His mother is a songwriter and his brother Edwin Vazquez is a very talented singer/songwriter and musician. His father Roberto Vazquez Sr. was an extremely talented guitar guru and a Maestro of Harmony. 2001 marked a very special year! Roberto’s 1st CD was released (in Spanish) titled “LATINO SOY”, produced by JG Productions. This album was awarded by the ACE Organization (Association of Entertainment Critics) as the “Best Local Artist of the Year”. This was Roberto’s first music award to his career! In 2002, Roberto’s 2nd CD “Pase Lo Que Pase” was produced which was geared more on the romantic genre. This CD included the song “DIME” which Roberto wrote and is a flamenco pop composition. He had the honor of performing a concert at “New York’s “Hard Rock Café” to promote his album. This was a great success for his uplifting career! 2005 marked extraordinary performances on legendary stages such as “Merkin Concert Hall” and the world re-knowned CARNEGIE HALL in “A Dreams Fulfilled Concert”. For the year 2006 Roberto will be dedicated to songwriting and in the studio working on his 1st original CD production. This album will have a variety of music (Pop, Gypsy, Rock/Blues, Tropical, romantic ballads and Arabian rhythms) and will include songs in English as well as Spanish. He will be entirely involved in the production of this CD and has a very talented group of musicians and engineers working with him. Roberto has had the honor of working with amazing talented musicians such as Richard Holley, Darren Lipper, Casey Howard, Frank Picarazzi, Eladio Gonzalez, Elena Rojas and lovely female vocalist Ayana Del Valle, among many others.